Babylon 5 is my favorite science fiction show of all time, and Delenn is easily my top character on that show (it’s not even a competition, guys). 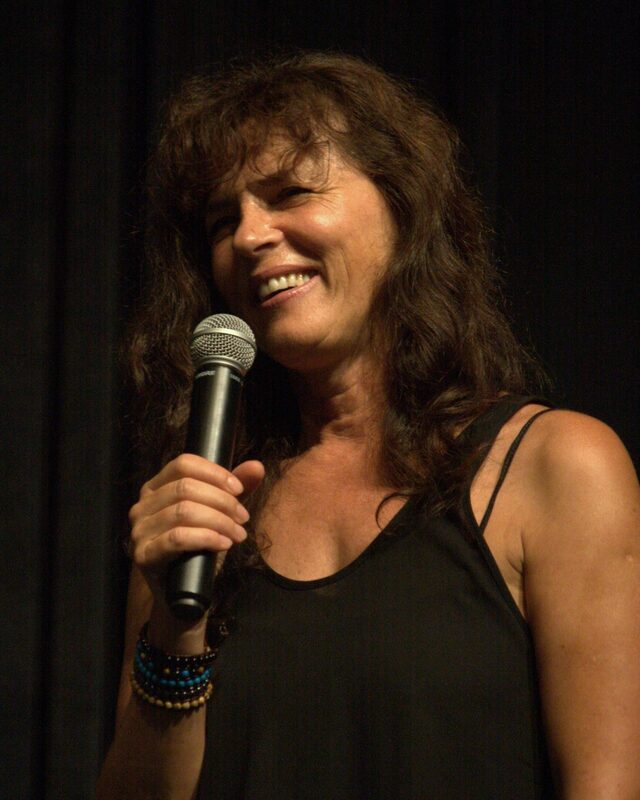 When Mira Furlan, the brilliant actress behind that role, was announced as a special guest at Comic Con Honolulu I jumped at the chance to speak with her. She’d been at San Diego Comic-Con two weeks prior, but my schedule had been far too packed with press events to have a chance to see her, so I feel incredibly lucky to have been given a second chance. 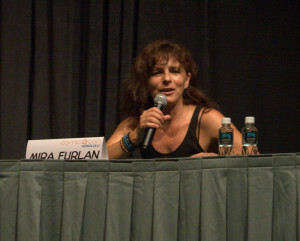 Mira Furlan has portrayed two of the most badass female characters of genre TV. Delenn, though a member of the Religious Caste in the Minbari social structure, was fierce and managed to turn around heavily armed Earth Fleet forces. Danielle Rouseau, also known as the “French Woman” on Lost, survived for years on her own on an island that has something ready to kill her at practically every turn. Both were incredibly powerful and could hold their own in their respective genre shows. Though Furlan says choosing such roles wasn’t intentional on her part, she does acknowledge that it feels great to play women who weren’t there primarily to support the male characters. With this as a launching point for our discussion, I dove deep into her experiences with fandom, her acting history, and what it feels like to be back in Hawaii for the first time since she filmed Lost. Q: [Babylon 5] still picks up new viewers, even to this day, 20 years later. 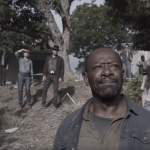 Does the staying power of the show surprise you, or did you feel like this was the kind of show that would be popular for a long time? MIRA FURLAN: No. I had no idea what I was getting into. I came from Yugoslavia, my homeland, that was collapsing, disintegrating into a bloody war, and that’s what brought me to America. And then Babylon 5 happened to me. 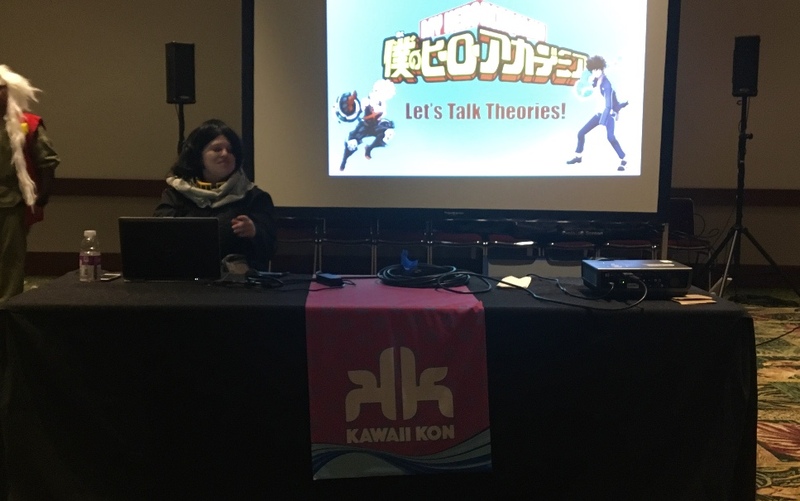 I had no idea, at that time, about even the existence of fandom as a phenomenon and science fiction as a genre, which has kind of a parallel reality of ours. So I was pretty new to that. So my expectations, I didn’t have expectations, which is good. It’s all a good surprise. 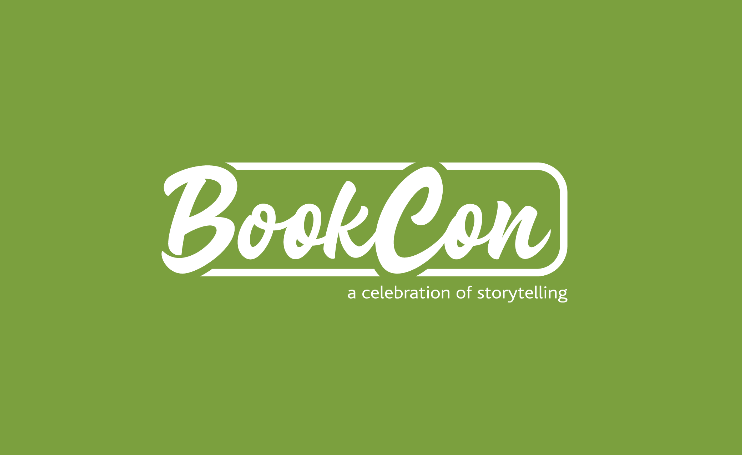 And that it’s lasting for all these years, and I do conventions all over the world, 20 years after, is kind of a miracle. Q: You guys were at San Diego Comic-Con, which is the biggest convention of its kind in the world, and you guys had a panel there, and a lot of you guys were there. And a lot of shows that are 20 years old wouldn’t have that type of stuff. MIRA FURLAN: Right. It’s amazing. It’s the quality of writing, and then I think also the quality of acting that made Babylon 5 special. Q: It is a very special show. Another thing about Babylon 5 – Leonard Nimoy was in the reboot for Star Trek, Richard Hatch was in the reboot for Battlestar Galactica. If Babylon 5 ever got a reboot, would you consider popping up in it? MIRA FURLAN: Sure, sure. That would be a lovely thing. Q: That would be great. I’m rooting for that. On kind of a casual note, have you been back to Hawaii since you filmed here for Lost? MIRA FURLAN: No, this is the first time I’m back. It’s very mind-blowing. Q: Has it changed a lot? MIRA FURLAN: We went to Kauai before this. We spent a week in Kauai and I was in Kauai 20 years before, and it stayed in my memories as a good place. […] It was beautiful and wonderful to be there. The thing you asked me, has it changed. Well, you know, we went snorkeling, and that stayed in my mind as the most incredible experience. […] I realized that damage has been done to these incredible places, so I saw this completely gray and dead coral reef. So this was happening. Hawaii is not immune to what we’re experiencing, the destruction of our planet. So that was a sad, sad thing that I experienced. Waikiki, I haven’t been around – I remember the place I loved to eat those macadamia pancakes and Eggs n’ Things [authors note: this is a local breakfast chain]. Suddenly they have three of those. So, you know, things are growing. Some things are dying. Some things, it’s busy as always and commercial as always. What I loved about Oahu is the north shore and east shore, which is getting out of Honolulu, which is so commercial, and experience the true beauty of Hawaii. Q: Have you had a chance to enjoy Oahu while you’ve been here yet? Or have you just been doing the convention so far? MIRA FURLAN: No, I do the convention, but we’ll have one day of driving around and experience the island and we’re looking forward to that. Q: I hope you have fun with that! Do you have any upcoming projects? 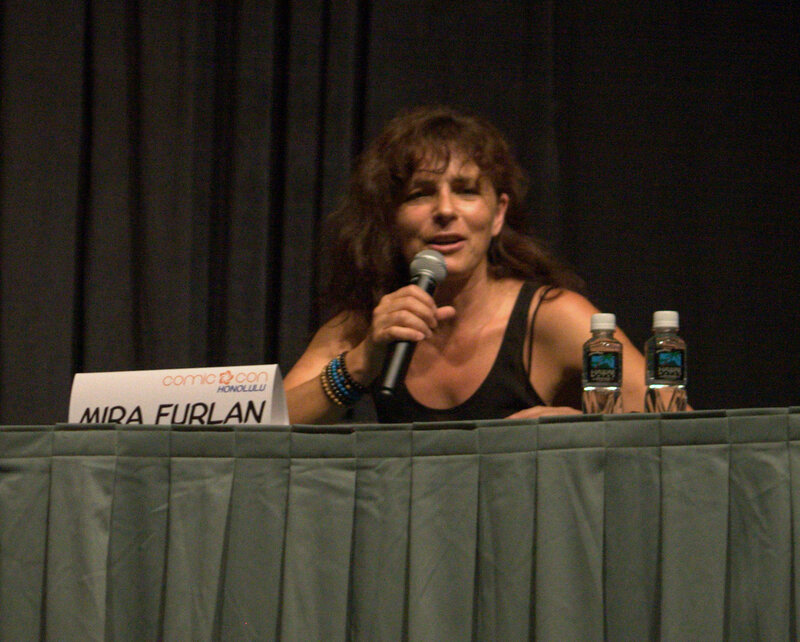 MIRA FURLAN: Yeah, I’m doing a recurring role on an Amazon show, which is called Just Add Magic. I’m just shooting it so. And there’s more to shoot when we come back. […] And also, it’s all over the internet, there is a series of films that we’re doing, with producer and writer and director Mark Zicree. It’s called Space Command, and we shot the first movie. It’s a science fiction project. And then the third one that is in the works is Lantern City, a beautiful, really interesting, also science fiction project, produced by Bruce Boxleitner, my colleague and friend. That’s in pre-production. So, you know, there are things happening. Q: Well, I’ll have to check that one out for sure. So it seems like you’ve definitely gotten into a genre even though you didn’t really know genre TV and stuff before Babylon 5. Now you’ve been doing a lot of it. Do you watch other genre shows besides the stuff that you’re in? MIRA FURLAN: I mean, I don’t know. Not specifically. I don’t search it out, genre shows. But I love to see a good science fiction. For example, this movie, the last thing that I did and really loved, was this film Ex Machina. Have you seen it? Q: I have not seen it. But I’ve heard of that. MIRA FURLAN: That was really good. 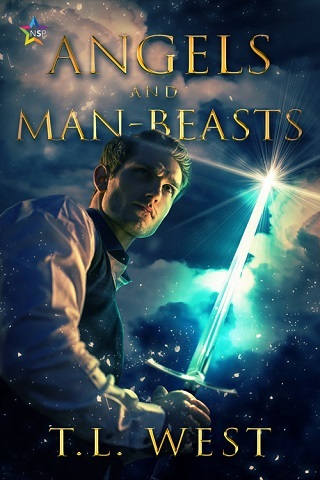 Dystopian, very interesting. It was a pleasure to talk to Mira Furlan and now I’m extremely excited to see the project being produced by Bruce Boxleitner come to pass. Their chemistry was one of my favorite parts of Babylon 5, so them teaming up together, even if one is on screen and the other is behind the camera, thrills me to no end. This is one I’ll be putting on my calendar for sure.